To open an SDF file either launch the application and use the open dialog to select the molecule file or drag and drop your file on the application icon. Multiple SDF files can be opened at the same time. By default it is “Cluster”. Press escape or cancel in the dialog if this default is ok for you. You can create a new property for the grouping and also copy values from another property to start with. Hold down the mouse right button and drag to translate the view. Use the W(up), S(down), A(left), D(right) keys. The Arrow Keys move too the view if no molecule is currently selected. Zooming is always towards the mouse cursor position. Use the ‘R’ key to fully zoom on the mouse cursor. Press ‘T’ to fully unzoom. ‘E’ will zoom on the group under the mouse. Use the view dropdown to center the view on a specific group. The minimap makes large dataset navigation easier. The white rectangle on the minimap represents the current viewing area. The blinking dot represents the centre of the screen. on the minimap will centre the view on the mouse cursor position. over the minimap will make the current view follow the cursor position on the minimap. It will appear in a small window in the top-right side of the screen. At the same time the molecule is highlighted by a moving light to show its position in the working area. At high zoom level the moving light is replaced by a less distracting square. on the molecule in the zoomed window will center the view on it. it over the desired group. Then release the button. When several molecules are selected and you move one of them to a different group, all the selected molecules will follow. it over the group you want to add the molecules. Release the button to finish the action. on the group title. A dialog appears to type the new name. on its title. The color of the group turns green on the main view and in the minimap. , surround them with the lasso. The background of the selected molecules will turn green. Release the button to finish the action. to add more molecules to the current selection. , draw a lasso to select a set of molecules. , draw a lasso to add molecules to the current selection. , draw a lasso on the background of the main view to clear the selection. on a group handle to select its content. + ‘A’ to select all the molecules currently visible on the screen. 4 Different selections can be kept separately. By default the first selection is active. To differentiate the selections, each one has a specific color. Zoom very close on a molecule containing the substructure to search for. Use the selection lasso (see simple selections) to define the search substructure. The selected atoms become orange on the screen. , the “find fragment” button. The molecules containing the fragment become selected. If during the selection process the lasso crosses the boundaries of the molecule frame, the atom selection process is canceled and the selection mode switches to molecule selection. Select in the menu “Object -> Group by similarity” or press ‘%’. A dialog appears requesting to enter a cluster similarity threshold. Press enter to start the clustering. Please note that this action may take long depending on the number of molecules to cluster. A progression bar shows the percentage of time to completion. Following the clustering, a new property called “similarity” is added to each molecule, numbering the newly created groups. 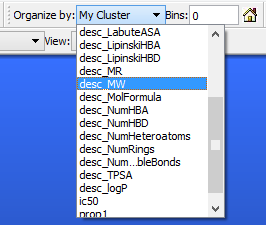 At the end of the clustering the view shows the molecules organized by similarity into groups. To select the 10 structurally closest molecules to a reference molecule, move the mouse cursor over it and press ‘J’. to open the context menu. Select the option “Subgroup by similarity“. Enter a similarity threshold in the dialog box. A supercluster is created that contains all the similarity groups. The “Subgroup by similarity” can be repeated with various thresholds until a good clustering is obtained. The list of properties is displayed for the molecule currently under the mouse cursor. If the selected display property is not defined for a given molecule, its background appears in gray. + ‘F‘ to go to the Search input field. Select the property to be scanned from the dropdown menu. Type the text to search and then press enter. The first molecule found becomes current and is displayed in the zoomed window. to navigate along the molecules. To select the result of the query check the “Select” checkbox before performing the search. To add the current selection to the following search result use the “Select” and the “Append” checkboxes. Complex text searches can be performed using regular expressions. To do so check the “RegEx” checkbox. If the clustering property is numerical (like molecular weight), every group will likely contain only a single molecule. To merge a range of numerical values inside a single group enter a binning value in the “Bins:” input field and press enter. Enter 0 as a binning value in the “Bins:” input field and press enter to revert to a numerical clustering based on unique property values. Enter the name of the new group in the dialog box. If the name already exists, a number is automatically added at the end of the name to avoid ambiguity. The new group is placed at the mouse cursor position if you use the keyboard shortcut. Otherwise it is placed at one of the edges of the working area. “new supergroup” button or use the ‘§’ shortcut. on the group to drag it onto the super-group. To visually compact all the super-groups use the menu “Groups -> compact group“. To visually compact a single super-group, press the shortcut key ‘C‘ while the cursor is on the super-group. on any group name to center the view on it. Select the property to use for sorting in the dropdown list. The arrow button next to the “Sort:” dropdown changes the sort order when pressed. or press ‘v‘ to tidy up the screen and the position of the groups. The reorganization is purely visual to minimize the space occupied by the groups on the screen. on a molecule to start the navigation. This makes it the current molecule and displays it in the zoomed window. Zoom in with the mouse wheel until your feel comfortable to appraise it. Then use the right arrow to move to the next molecule. The view is centered on it and it becomes the current molecule. Use the left arrow if you want to return to the previous molecule. The up and down arrows move the focus to the molecule displayed respectively one row up or down. on it) in a first group you want to browse. + left arrow key. The view focuses on the next group and zooms to fill the view. + “right | up | down” arrow key. 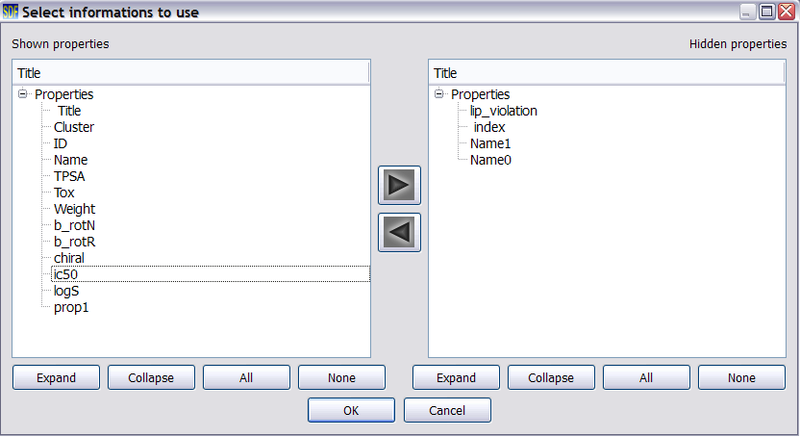 A dialog appears to select up to 4 properties to display. 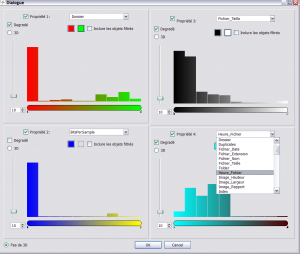 Select a property in the dropdown menu and check the “Color ramp” checkbox. 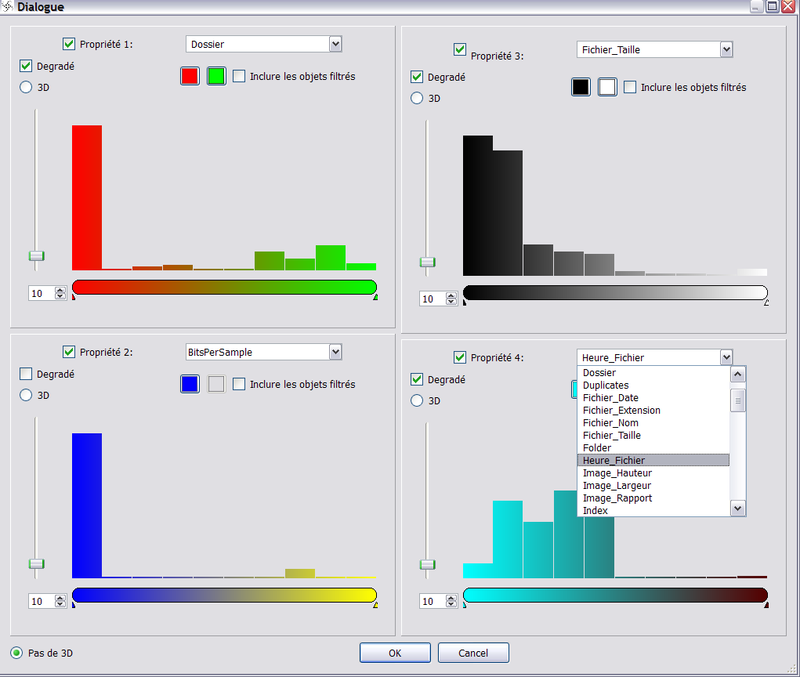 A histogram of the values of the dataset for that property is displayed and colored. the triangles on the color bar. Press ok and the molecules will be colored according to their property values. In the “Display colored properties” dialog, check the “3D” checkbox next to the property to display in 3D then press ok. Select “no 3D” at the bottom of the dialog window to remove the 3D effect. Note that for very large datasets, the 3D Property Bar view may significantly decrease the performance of the display.
. The filter dialog box appears. Select from the list of properties (green rectangle in figure), one to use as filter. Numerical : Adjust values with two sliders. Alphanumerical : Fill the “Like:” field with a regex or a simple text filter. Date: Select a starting and ending date (as in black rectangle in figure). Press the “Add/Update” button to include the new filter into the list of filters at the top of the dialog (red rectangle in figure). All the filters are then applied to the dataset. To change the range of a filter and see its effect in real-time, click on the filter in the list, check the “real time filtering” checkbox and then move the sliders. The molecules are on the fly filtered in or out as you move the sliders. to temporarily show all molecules. In the dialog box select the two properties to use for the X and Y axis and the way values from the molecules in the groups are used (min, mean or max) and press ok.
and rotate the mouse wheel. The size of the groups increases or decreases but their graph coordinates do not change. key and move the mouse cursor over the cluster. A graph is attached to the left side of each group. If necessary press ‘v‘ to reorganize the view and avoid overlapping. Placing the mouse over the dots in a graph displays their coordinates. on a dot to make the corresponding molecule current. esponding dot in the plot. to display the dataset as a spreadsheet at the bottom of the screen. on the line numbers to center the view on the corresponding molecule. on a molecule in the view to reach the corresponding line in the spreadsheet. In the dialog box type the name of the new property. Finish your formula with “*1e-9)” and press enter. on a column title to display a context menu where you can choose to “hide, show all, rename or delete” columns. on a column title to sort the spreadsheet using this property. Do it again to reverse the sort order. Press ‘T‘ to instantly zoom on the location pointed by the mouse cursor. Press ‘R‘ to instantly zoom out and display the whole dataset. Press ‘E‘ to instantly zoom on the cluster under the mouse cursor. Alternate ‘T‘,’E‘ and ‘R‘ to quickly navigate a dataset and focus on groups or molecules that catch your eyes from the whole dataset level. on a molecule to center the view on it. to center and zoom on the molecule. Select Fix/unfix in the context menu. A glowing rectangle will be displayed around the frozen groups. Move the cursor over a group to freeze and press ‘F‘. is pressed (or ‘v‘) but their position relative to each other will stay the same. Move the cursor over the name of a group to hide. on the title. The group is now hidden. The hidden groups only appear in the tree view as gray items (see 15. Create groups and super-groups of molecules). on a group of the tree and select “show” to make the group visible again. To show all hidden groups at once use the menu “Groups->Show all“. + ‘Z‘ to undo the delete molecule (or use the menu “Edit->Undo“). If a selection is active and you delete one of the selected molecules, all the selected molecules are deleted. Subgrouping consists of assigning the molecules of each group to new groups based on selected property. Theses new groups are added to the original group which becomes a supergroup. A dialog box appears to choose the secondary grouping property (the current grouping property is grayed out). Press ok.
Each group becomes a supergroup containing molecules grouped by the secondary property. to display the context menu. Select the item “group by” and choose the secondary property in the submenu. Note: This operation cannot be undone at the moment (v1.00). 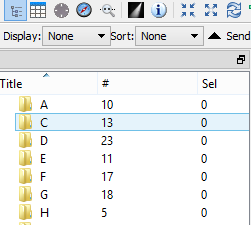 The property selector is used to select which properties loaded from the SDF file are to be displayed/hidden. Press the property selector icon. A dialog box with 2 lists appears. The right list contains the properties to display. The left list contains the properties to hide. Important note: properties that have been hidden are not saved when using “File->Save“, “File->Save as” or “File->Save Selected“. Each molecule of the dataset has an internal clock measuring the viewing time i.e. the time it has been displayed at a high zoom level. When this viewing time is displayed, it is possible to easily spot the zones of the dataset that have been overlooked. The viewing time is represented as a colored circle above each molecule. The size of the circle is proportional to the time spent displaying the molecule at high zoom level. A green circle mean the molecule has been displayed at least 3s. The circle is hidden at high zoom level to avoid overlapping with the molecule. The molecules can be displayed in 3 different ways: wire, sticks and spheres. These 3 modes are accessible from the “Molecules” menu. key and rotate the mouse wheel to change their size.